We spoke to Helen Brasnett, Clinical Psychologist at the Anna Freud National Centre for Children and Families about the Parent Consultation service which is an example of meeting the needs of parents of children and young people who are ‘Getting Advice’ in the THRIVE framework (Wolpert et al., 2016). The Parent Consultation Service (PCS) is provided by the Anna Freud National Centre for Children and Families (AFNCCF) and provides one-off, 30-minute phone calls with parents who have children aged 0-18 who they are concerned about. The service has been providing high-quality advice and signposting for parents since 2009. The idea for the PCS was initially conceived because there were some families who would attend the first appointment of a course of therapy who actually just needed some information about self-management strategies or access to other services but were finding it difficult to access the right information. PCS receives an average of 150 phone calls a year. Common reasons for parents phoning include needing advice on handling a divorce or separation, their child’s transfer to secondary school, coping with bereavement, behavioural difficulties, ADHD, conflict within the family, anxiety and self-harm. Some of the parents who make use of the service have had a lot of experience of the child mental health system already and may have been unsuccessful in getting the kind of help they wanted so need help to think about what they really need. In other cases the PCS contributes to early intervention for children whose parents have picked up on a worrying change in behaviour. Parents wanting to use PCS will initially contact the team administrator to fill in an enquiry form prior to the phone call. The purpose of the enquiry form is to provide the clinician taking the call with some background information including where they live and GP contact details to allow for safeguarding procedures to be followed should concerns arise during the call. It is particularly useful in cases where the family is not local so there is time to for the clinician to research some useful resources near to the family. The parent is then booked in for a 30-minute phone call within two weeks of them making their initial contact. The phone call is strictly 30 minutes long. Helen says it can be surprising what can be achieved in that amount of time. There are occasions on which the 30 minutes can feel too short but there is a feeling that if you cannot do what you wanted to in 30 minutes then you are probably not going to be able to do it 45 minutes either. At the start of the consultation the clinician asks what the parent would like to get from the call in order to keep the 30-minute conversation focused on achieving that. Helen says that the PCS uses a mentalizing approach to support parents to develop their own capacity to think about the thoughts and feelings of their children, through perspective taking. A shared understanding of what will happen next is usually reached by the end of the call. The parent can sometimes be frustrated that they will not be offered a service at the AFNCCF, and this is discussed in detail to support transparent and open decision-making about what is being offered and why. Other resources are usually signposted to, including self-help and self-management resources such as websites, books and leaflets. Clinicians taking the call always keep risk and safeguarding in mind and will discuss the limits of confidentiality with parents at the beginning of the call and that it may be necessary at times to talk to other professionals. Consent for this is always checked before the call progresses. The clinicians may advise the parents that it is appropriate to contact their GP surgery or CAMHS to push for an appointment if they feel they or their child need to be seen. Parents are sometimes supported to seek help for their own mental health and well-being by consulting with their GP for a referral to IAPT, or they may be supported to seek couple’s therapy. Following the telephone consultation, the clinician writes a letter summarising the consultation, and sends this to the parent. If it has been agreed during the consultation that the clinician will refer the parent to their GP, the letter will also be sent to their GP. Consultations may also be followed up with referrals across all sectors, including social care, parenting groups, bereavement groups or online resources for children and adolescents. The PCS is currently delivered by two experienced clinical psychologists who provide the consultations and write the summarising letters. They each contribute half a day each week to the service, and a typical week will see them both provide two consultations. PCS has received grants in the past to deliver the service in the London area. At the moment the service is funded through a combination of grants and the support of the AFNCCF. Following the PCS call all parents are emailed a feedback form. Of those returning the forms there is a high level of satisfaction with the calls, with parents citing the value of talking to an experienced mental health clinician and feeling that their concerns were taken seriously. They valued the letter and the confidence this gave them in their own decision making and in their parenting. How does PCS fit with the principles of the THRIVE framework? The payment by results work which influenced the development of the THRIVE framework found that there are at least some families who may just need a brief, one-off contact with a professional to provide reassurance and advice, which then allows them to self-manage without further input. 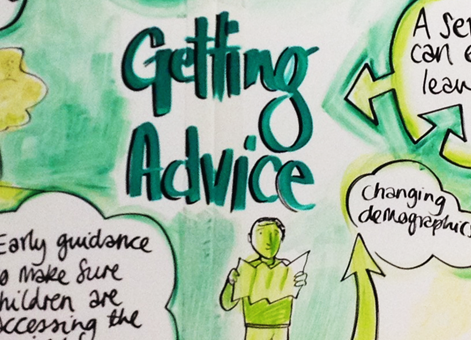 The THRIVE framework promotes experienced professionals providing ‘Getting Advice’ and signposting to support service users accessing the most appropriate services in a timely way to increase the likelihood of improved outcomes. Through researching and signposting to helpful local resources, the PCS promotes effective use of community resources which is promoted within the THRIVE framework. The letters written following consultations highlight the existing strengths of the family, and what is already working well, which is aligned to the THRIVE principle of drawing on the existing strengths and resources of the family wherever possible. If you would like more information on the Parent Consultation Service, please send queries to Helen Brasnett at Helen.Brasnett@annafreud.org.